In the 1960s, Staples High School was in the forefront of social change. Students could take “Experimental English.” On an open campus, they came and went as they pleased. 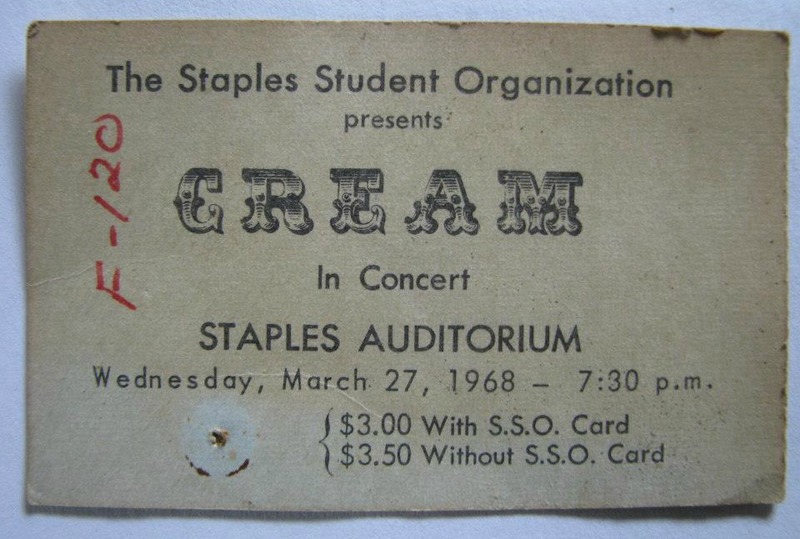 Bands like the Doors, Cream and Yardbirds played in the auditorium. Staples was also one of the first schools anywhere to hold a “Computer Dance.” After teenagers answered 50 questions, an “electronic computer” matched them with their “perfect” partners. Staples may also be the first place where a “Computer Dance” actually led to a marriage. This weekend, Collin and Sherida Stewart enjoyed their 50th high school reunion. In June, they celebrated their 46th anniversary. None of it would have been possible without that new-fangled computer. And the desperate financial straits of the Staples Student Organization. 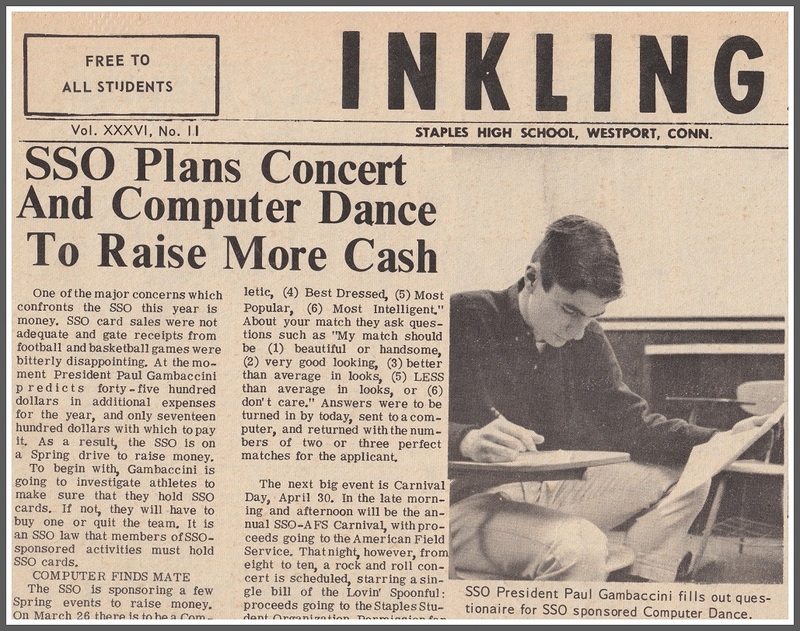 The “Computer Dance” was page 1 news in the Staples High School newspaper “Inklings.” Student government president Paul Gambaccini is shown supposedly filling out the match questionnaire. Back in the spring of 1966, the student government needed money. SSO card sales were low; gate receipts from football and basketball games were “bitterly disappointing,” said the school paper Inklings. What better fundraiser than a “computer dance”? Students replied to questions about their own looks, intelligence, activities, cars, favorite school subjects, TV-watching habits, movies, and time spent on the phone. Then they answered the same questions about their ideal match. Part of “ideal partner” questionnaire. Even though a computer did the matching, students answered the questions by hand. Sherida Bowlin was a relative newcomer to Westport. She entered Long Lots Junior High School in 9th grade, when her dad’s employer transferred him from Kansas to New York. Collin Stewart was even newer to town. Amoco moved his father from Houston to New York in the winter of 1966 — the middle of 11th grade. In fact, he was not yet at Staples when he filled out the computer questionnaire. His dad — already here — heard about the dance from a new acquaintance at the United Methodist Church. Realizing it was a great way for his son to meet people, he called Collin. Together on a long-distance call, they filled out the questionnaire. Collin Stewart and Sherida Bowlin at the junior prom. They shared “maybe 1 or 2 dances,” Sherida recalls. Neither remembers if there was a live band, or records. 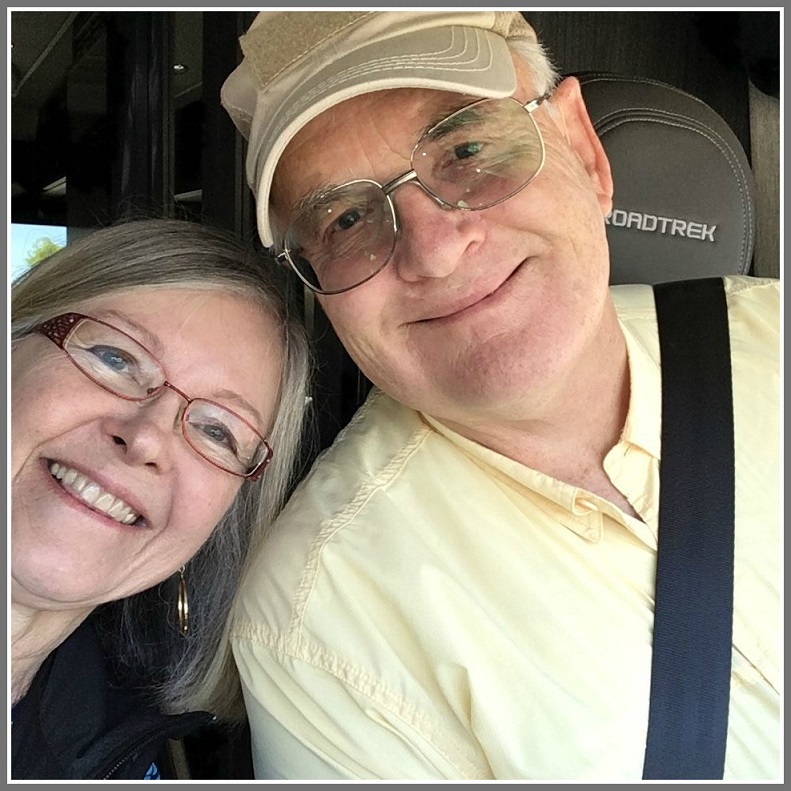 Their friendship grew quickly — though more at their shared Methodist Church than Staples. Their 1st real date was the junior prom. Soon they were going steady. They continued all through the next year. 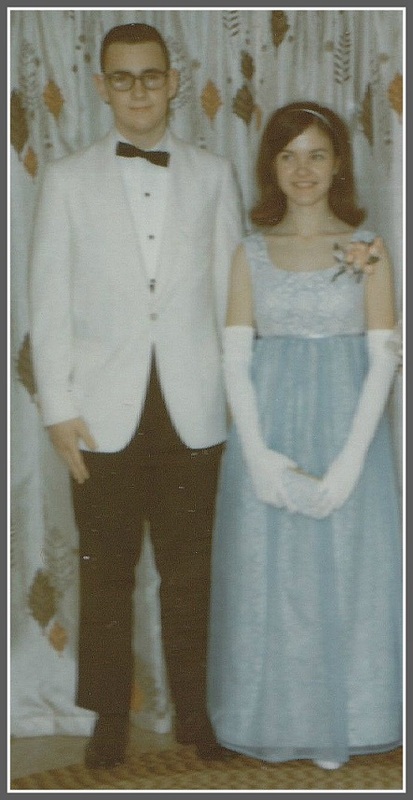 By senior prom, they were a well-established couple. Within days after graduation however, both families moved. Sherida’s went to the West Coast; Collin’s to London. But they’d figured out a way to stay together. Collin was going to the Colorado School of Mines. His father and uncle both graduated from there — and he wanted to major in geological engineering. Sherida headed to the University of Colorado — just 20 miles away. 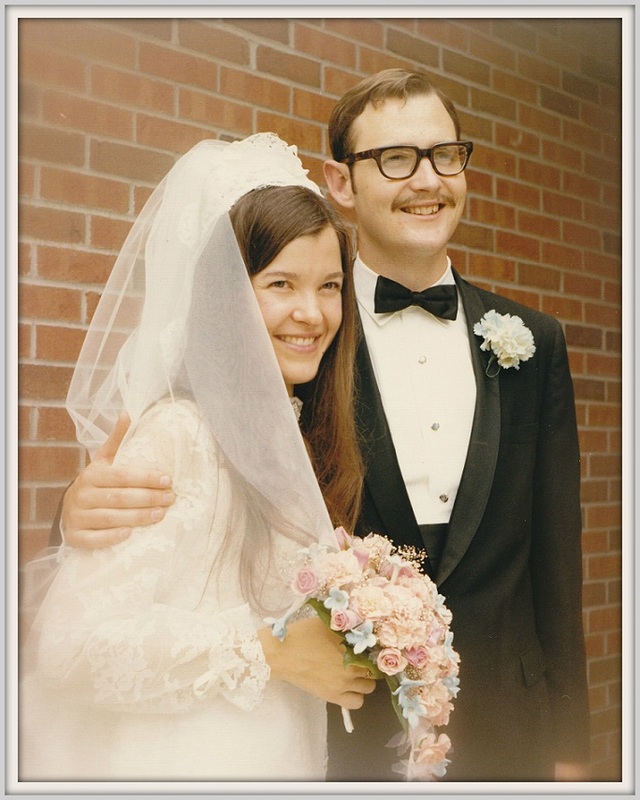 In June 1971 they got married in Lebo, Kansas — her grandparents’ hometown. Mr. and Mrs. Stewart, on their wedding day. Collin’s job as a mining engineer took them all over the West. They lived in Colorado, Wyoming and Nevada. They love the outdoor lifestyle. They’re now in Farmington, New Mexico, in the heart of the gorgeous Four Corners. They have 2 sons, and 3 grandchildren. “We remain each other’s best friends,” Sherida says. Collin earned a master’s degree before their kids were born. After he retired, he went back to Colorado School of Mines for a Ph.D. As of last December, he is Dr. Stewart. Sherida and Collin Stewart, in a recent selfie. Collin came back to Westport just once, a couple of years after graduating. Until this weekend, Sherida had never been back. Both looked forward to returning here. After all, had it not been for that “electronic computer,” the previous half-century of their lives might have turned out very, very differently. In 1917 John S. Backiel bought 7 acres of land on the dirt-filled Post Road, near Maple Avenue. He paid $5,000. According to Jack Backiel, his grandfather — John S. — said that selling a bucket of golf balls was just like selling a basket of tomatoes. Except you got both the basket and the tomatoes back, to sell them again the next day. Jack was just 7 years old in September 1954, but he remembers opening day. Trick shot artist Paul Hahn wrapped a club (actually a hose) around his body, then swung it and hit a ball off the mouth of his wife, as she lay on the ground. The golf range “was my whole life as a kid,” Jack recalls. In October 1958, the Backiels opened a bowling alley — only the 2nd 10-pin alley in the state. Economics favored recreation over farming. John, Adolph and Stanley Backiel, inside Westport Lanes. There were 8 owners: John S. Backiel’s children. Daily management was the responsibility of 3: John, Stanley and Adolf. The site is what is now Pier 1.
Business boomed. With lines out the door, the original 16 lanes soon expanded to 32. Soon, the Backiels added a pool room downstairs, and the Club 300 bar. In the early years John Hersey — author of Hiroshima, and a former member of Westport’s Board of Education — bowled there several times a week. Next door, when Mickey Rooney — acting at the Westport Country Playhouse — would hit buckets of balls at the golf range. Then he’d hang around for a couple of hours, talking to women and giving impromptu “golf lessons” to whoever listened. Those recollections — and many more — come from Jack Backiel, John’s son and John S.’s grandson. 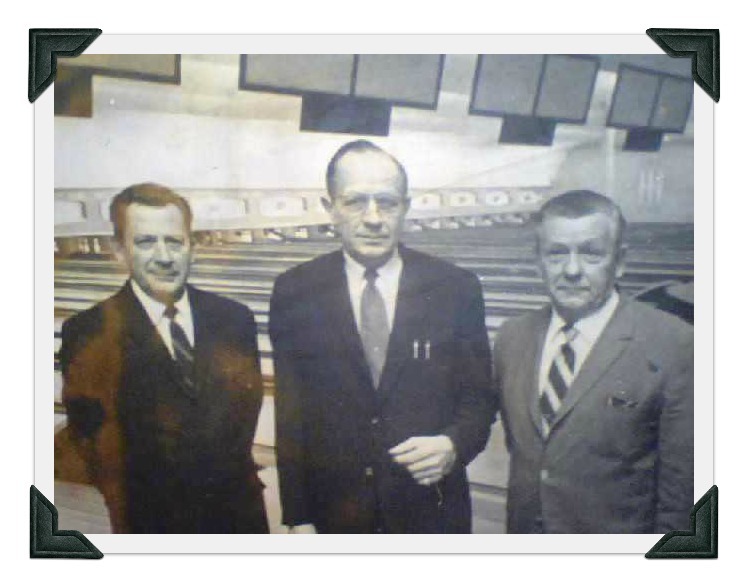 Jack says, “Our family was definitely on the cutting edge of bowling, as the new wave of family recreation began in the United States.” Bowling leagues thrived, from 1960 through the mid-’80s. Local businesses sponsored teams, advertising their names on the back of shirts. The bowling alley stationery showed the building’s 1950’s-style facade. In the fall of 1961, Westport Lanes was on “Candid Camera.” The last 2 lanes were rigged so that thin piano wires ran under the pins. When a couple came to bowl, they were assigned those lanes. “The guy would bowl his regular score, but every time the woman got up, a mechanic in back would pull a lever. The piano wires moved just enough so all the pins fell down, no matter where she threw the ball. Paul Gambaccini — the “Professor of Pop,” and one of the most famous radio and TV music personalities in the UK — grew up not far from Westport Lanes. Earlier this year, in a Financial Times profile, he related the pinpoint accuracy of bowling to his precision cuing record. And he recalled his earliest bowling days. It was that period of the suburbanisation of America when an indispensible part of every new town was the bowling alley. It’s broken my heart to see bowling go downhill. Now it’s a sort of retro, kitsch thing. Nixon, for all his faults, was a bowler. He had a bowling alley in the basement of the White House. One night in 1972, while the lanes were being refinished with a flammable coat of lacquer, they went up in flames. The cause was spontaneous combustion, Jack says, and the intense heat twisted steel. A year later, the rebuilt Westport Lanes opened again. 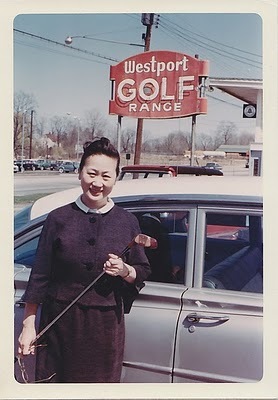 Frances Lee at the Westport Golf Range, next door to Westport Lanes. The bowling alley remained a kingpin of local recreation until 1984. Jack’s father — the youngest owner — was already in his 60s. The property was their nest egg. They sold the lanes and adjacent golf range for $6.8 million. Two of the original owners are still alive. One aunt is 95; the other just turned 101. That entertainment resonated with countless people. To this day, Jack says — even in retirement in Florida — when someone hears he’s from Westport, and that his family owned the bowling alley and golf range, they remember it. And then they tell him stories about their favorite times there.